I'm just now going through photos on my phone and trying to organize things and I realize, I have fun photos from before Lucy's birth that I never got to share with you! So the day before I went into labor, we spent some time walking around Duluth being tourists and just hanging out together, figuring once the baby was here that quality time would be limited. And how right I was. We went to a park, took in the pretty lake and looked at some cool stuff. Penelope got to see flowers, her most favorite thing in the entire world. It was everything in her to not pick them and to not climb into the actual bushes. Then we headed down to Canal Park because I figured we could have lunch down there and the kids could throw some rocks into the water. Which Penelope absolutely LOVED. She could have thrown rocks all day but we bribed her with food to get her away from the water. Not before her picture with dad while sitting on a big rock. She didn't totally get why the giant rock could not come home with us. We even got a quick picture of us while I held Penelope's hand so she didn't run off towards Olivia and Jackson. Or seagulls. Obligatory summer picture, sadly Penelope didn't want to cooperate. We ended up having lunch at Grandma's Restaurant and it was great as usual. Penelope was quite the love bug. We had to head home afterwards because I was pretty tired and ended up taking a nap while Penelope did. And I can't leave you without a belly shot, what would become the very last one of this pregnancy at 39 weeks. It's worth noting that after this photo was taken, right around dinner time, I have no actual memory of anything until the day I leave the hospital. I'll share Lucy's birth story this week, as best as I can piece together from what I've been told and texts that I apparently had before all hell broke loose. But it's weird to look at that picture and think- that was it. That was my last day pregnant ever. So I'm going to apologize but you won't get detailed photos of my box this month because I couldn't find my camera, and my phone.. yeah. Just be happy that I got the one. A decomposition notebook: normally I'd be disappointed in this because who doesn't have a crap ton of these little things laying around, but considering I'm losing my mind and having to write things down, this is perfect for me. Hogwarts button: I'm too old to be doing the button thing anymore, so I gave this to my sister in law, who is a big Harry Potter fan! A necklace of the Eleanor & Park cover and that's adorable so I kept that. A print of the Harry Potter trio which... not sure what I'm going to do with. I've got a stack of these prints now and no idea what to do with them. We also got an adult coloring book courtesy of Blue Star Coloring and I gave that away because I'm now in the process of letting things go and not keeping them for the sake of keeping them. My sister in law got that, too. The book this month is P.S. I Like You by Kasie West, who also gave us a signed bookplate, letter, and colored pencils (seemingly to go with the coloring book). I kind of love the signed bookplates and letters- I always keep those in the front cover of my books. Anyone who borrows the book from me after get to read the letter, which is always kind of a cool touch from the other. I'm nerdy like that. The theme for September's box is DARKNESS, and they tease that we'll receive a "spooky and peculiar new item from Out of Print", and they show an image from Miss Peregrine's Home for Peculiar Children, which I still have not read. The movie is coming and I am grossly unprepared. I'm going to get my crap together soon, I swear. I super swear. I'm on it, lambs. 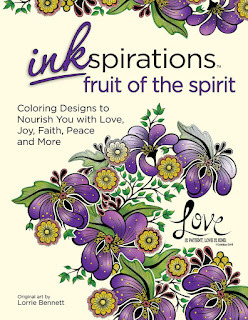 Inkspirations: Fruit of the Spirit review! Honestly, could this book have come at a better time? I've read that coloring is supposed to ease stress and help you unwind, and if there was ever a time I could use that, it's been this month for sure! Every Christian knows that putting the Fruit of the Spirit into practice takes a daily effort and commitment, and it takes a lifetime to master any one of them, let alone all nine. 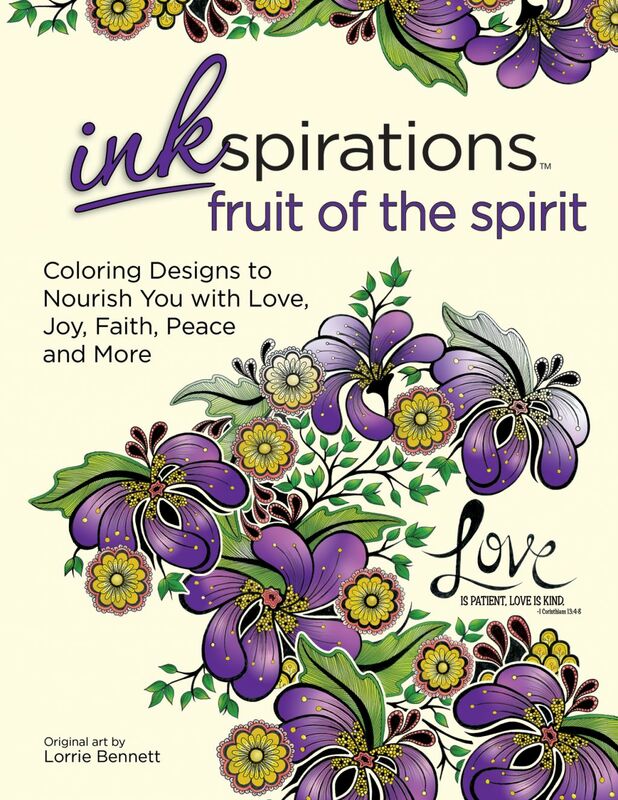 In this new coloring book for adults, Inkspirations Fruit of the Spirit celebrates these powerful virtues that help to fortify us throughout life’s joys and challenges. Each empowering verse alongside inspiring images reminds us of how acts of kindness, gentleness, or self-control can make a difference, not only in our own lives, but more importantly, in the lives of others. The more we focus and allow God to work in us, the more His spirit can shine through us. Illustrator Lorrie Bennett is known for painting vintage Bibles. Dating back to the early 1900s, many of her Bibles have been discarded because they are so worn. Inspired by the thought that the Bibles provided spiritual guidance for generations of people, she decided to give them new life by using them as canvases for her unique artwork. This style is adapted to many of the coloring pages within Inkspirations Fruit of the Spirit, so that the Word of God becomes a literal and figurative backdrop for your creations. Now you can color your day brighter, turning your art into meaningful and memorable keepsakes that show God’s Love and Grace. So while I am admittedly not a religious person by any means, I didn't value the religious versus and text as much as maybe the next person would, full disclosure. But the images in the book are fantastic, and there are varying degree of difficulty of images for you to color. The book itself is 72 pages and I did some of the easier images, mostly because my current ability to sit and do tasks isn't near as long as it normally would be. If you aren't familiar with my recent ordeal, you can go here to read up on it. To say I've struggled with memory loss is an understatement, and as bizarre as it is, being able to sit and color for a few minutes at a time has really helped me not get angry at my current situation. The other cool thing about this coloring book, which has been different from other books I've seen, is the front of the book features a lot of coloring information. Things such as tips & tools, how to choose your colors, different techniques to use as well as some palette ideas to get you started make this a bit unique compared to what you can pick up at your local discount store. And if you really have no idea where to start or feel like you have zero creativity, there are some examples of finished pages completed by people like you. My immediate thought is that this would be a really great gift item for your friend who is involved in church, or maybe a someone who volunteers a lot at church and you want to be that person to give them a little something of thanks for their hard work. It's the immediate person I think of when I think of giving this as a gift because it's beautiful, it's relaxing, and who couldn't use a little de-stressing in their life? Also very cool is that in the Inkspirations SHOP, you can find a bunch of products, but more specifically, cards! You can create a handmade card (hey- it's colored, it counts, folks!) and it comes with the envelopes as well. It's such a unique greeting to send, you know that would be something I'd buy someone as a gift. But in the shop you'll find lots of other coloring books by Inkspirations so if the religious option isn't for you, they have so many others that will appeal to you. The illustrations are wonderful and I think if you are in the market to try this trend out, this is the way you should go, easily. I'm trying desperately to get back to normal. The more I try, the less I know what that even is anymore. I'm really struggling with every day life and when people ask me what specifically, I can't even answer them. What I do know is that financially we're hurting. It's basically a miracle to have the GoFundMe account because Matt hasn't been working anywhere near his normal hours so his paychecks are basically non-existent and funny thing, your creditors kind of don't give a damn about your hardships or current life situation. We know we will have thousands in medical bills coming our way and that's actually really scary. I mean, what can you do? Make a payment plan and hope for the best, I suppose. I went to the neurologist as scheduled and that was basically a waste of time and whatever the cost of that is going to be. She told me my brain is mostly good. I've got a weird spot she isn't concerned about but doesn't know what it is, she's "pretty confident" I'm not a stroke risk, but my pituitary gland is "shot". Which makes the appointment with endocrinology even more important. Thankfully, with the insistence of my OB, that got moved from mid-September to this Friday. 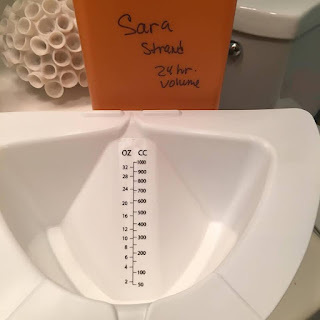 In order to get ready for that, they wanted me to collect urine for 24 hours. Which was mildly exciting because I had an actual job to do! That and it's going to be actual confirmation to everyone that I am peeing a ridiculous amount. It's really astounding because I had no idea my bladder could even hold 32 ounces of pee at once but IT CAN. In fact, it does it at almost every pee break which is anywhere from 30-60 minutes. That and I am excessively thirsty, which I'm told is also a weird pituitary gland thing so I am really hopefully that Friday's appointment is like... the best thing I have ever gone to. At this point, I am up in the night more than Lucy. Which isn't saying a whole lot because as it turns out, Lucy has a thing against sleeping on her back while not being held. That's been exciting. Also on the docket is I have an appointment today (Thursday) with a new general practitioner. My current one is in in a city thirty minutes away and my delivery and surgery team think I need someone new and closer, so they got me in with someone at the clinic my kids go to, which is two miles from my home. I could actually walk there if I felt so inclined. But that's tomorrow and frankly, I don't know what the point of it is, really. I hate going to the appointments because they ask me questions like, "how do you feel?" and it's like- I don't know? Like, I feel alright I guess. My insides hurt, I have depression and anxiety, I'm exhausted, but I'm also incredibly angry and frustrated at myself, at my body, at the world. Basically, Lexapro isn't cutting it, I'm sick of being treated like a baby but I know I'm not capable of being on my own, I want to leave the house alone, but that also feels exhausting, and I've never felt more helpless in my entire life. So.. that kind of sums it up. 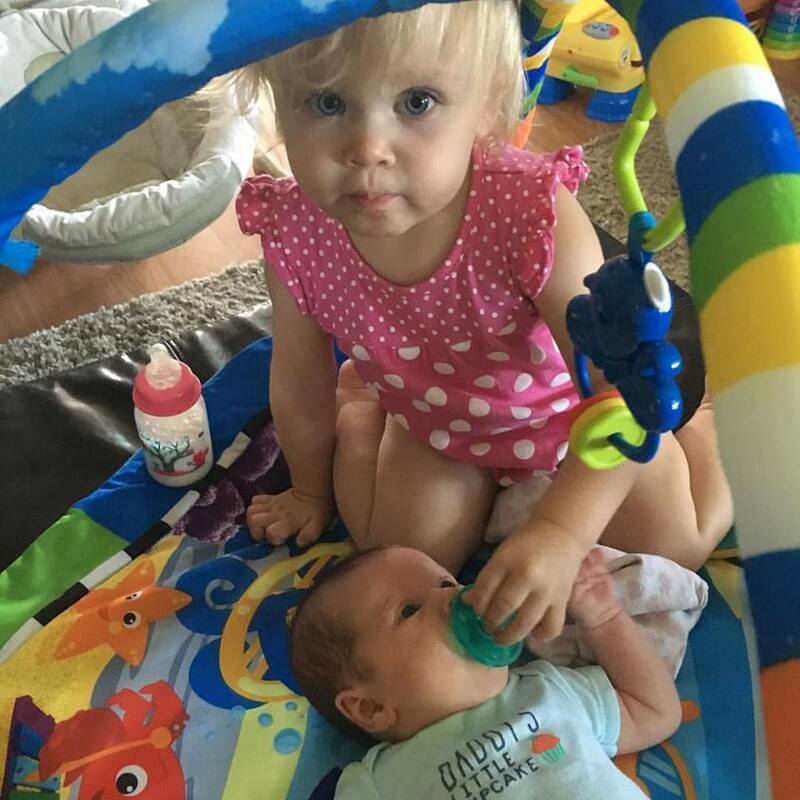 But I should also talk about Penelope and her adjustment, because while I'm quietly falling apart on the inside, this little bright light is doing a great job as a big sister. When Lucy cries, Penelope will either be the quiet observer or she panics and doesn't know what to do because it scares her. She is very interested in handing me things the baby needs, will rub her head, and generally pretty good when we have to take care of the baby before her for something. Right now she still has Olivia and Jackson to play with so I'm curious to see how she does when it's mostly the three of us. Well, my mom has been here every day with us (thank god), but I don't know how much longer she wants to do that. But it's been the best. My mom knows when to push me, when not to, she knows my bouts of silence are OK and doesn't constantly ask what she can do, she just does it. And she does everything the way I do it so it's never frustrating. I never feel like I'm being babysat. And there have been times where I just vent to her and she just gets it. Even when she doesn't, she at least makes me feel like I'm not actually crazy. So it's been hard. I don't know what normal is. I feel like I'm so far off the track of normal I might never get there. I'm so frustrated. I don't know what I need to get better, or what would help (aside from the lottery... I'm convinced a large windfall would be helpful), and I just want to be better. One friend said I probably need counseling for PTSD. And that's probably true. I have all of this frustration, and sadness, around Lucy's birth and I need to deal with it. But then I feel like such a whiny baby because I have a perfect baby and I didn't die after all. But now I get what people say when it fucks them up to almost die. It's a bizarre situation to be in. How do you even deal with that? I had Lucy! She's born, she's beautiful, she came into the world in a very eventful way on August 1. I almost died. Twice while giving birth due to an amniotic fluid embolism. More on that later. I actually remember nothing because I was in a coma and I sustained a whole list of damage from the AFE and subsequent surgery to save my life essentially. I start my follow up appointments today- first up, neurology. I'm hoping I can get some answers and start feeling like a normal person. Until then, I can't be left alone, I can't drive, my activity is limited, and I basically feel like a prisoner but I understand why. There have been times where I have seriously wondered why I was even allowed to leave- I'm obviously in no condition to be on my own. Thankfully I have a ton of friends and family dropping off meals, helping with the big kids, basically making sure I don't live in filth here. It's really nice. So more soon. I didn't want to go too many days and have you wondering if I actually died. Almost, but I'm not quite ready. If you remember, I mentioned how I am subscribed to the Stampin' Up Paper Pumpkin box, which is a monthly subscription with a fun craft project that you can do quickly and easily. It's only $19.95 a month and you get a stamp set and a mini ink pad that you can use over and over again, but you also get all of the supplies you need for the project itself. The price is really a great deal because you get a lot for your money and it's always a super fun (and easy) project. The theme for June 2016 was Banner Surprise, so let's see what I got. First, your box arrives in this super cute orange box so it's recognizably noticeable when you get your mail. Everything is wrapped in tissue paper. Inside you'll find your project kit and a really great instructional booklet that has your how-to, a website for more resources and ideas for your kit, and photos! I'm a visual person so if I can see what it looks like, I'm good. That's a close up of the front of the booklet. And here's what the inside looks like. It's a really great step-by-step of the project. But what did we actually receive? Quite a bit! The booklet also gives you a how to use these stamps if you aren't familiar, as well as how to clean and store them.They also have a Facebook page just for Paper Pumpkin, and other subscribers share what they've done with the kit. This particular booklet said it's meant to make a banner but also 6 cards. I don't really have use for a banner, so I'm going to be making just cards with my kit, and I finished my first 6. I did a bunch of thank you cards to have on hand because once again, I find myself without any more left. These came out super cute and I totally love the stamp set! I have decided I need to come up with a good storage system for these smaller stamp sets that don't come with a box or anything to keep them in, so if you have ideas- share them! .. just know I'll be using this for Olivia's upcoming birthday party. They are small favor boxes and I'm pretty stinking excited about this project! Stay tuned, lambs! If you know me at all, you know that I am the biggest sender of cards in general, but especially thank you cards. I send them for everything because it's a big deal to me. I know some people think a text or Facebook comment is enough but for me, I think the fact you took the extra minute to hand write a thank you, put a stamp on it, and get it to the post office is such a simple but nice gesture. Who doesn't love fun mail? Don't get me started on kid birthday parties where they kids DON'T send a thank you. It rubs me all sorts of wrong. In anticipation of people sending or bringing baby gifts, food, whatever, I've been trying to stock pile some thank you notes to just have on hand because I know I won't have time to whip them up with a newborn at home. I've gotten some new stamps lately so I'm trying to use some of them (possibly to justify their purchase) and I also have a LOT of pattern paper that I really need to use up. Isn't this card cute? It's such a simple design so it would be perfect for any kind of thank you and I guess I didn't realize how much I love a chevron background. I ended up making 12 of these cards because I had enough paper, and I'm keeping 6 for myself and have the other 6 in my Etsy shop! Click HERE to see them, purchase them, love them. So while we're waiting for Fetus Four to arrive, I've been trying to be crafty and get my Etsy shop going again in the hopes that I can maybe make even a little bit of money to off-set the costs of FOUR children. I know, every time I say it I feel a little sick to my stomach. So as I post things in my Etsy shop, I will share them here and feel free to share the post on your Facebook pages, Twitter, wherever. Help me spread the word! It seems silly to some people, but back to school is right around the corner (YAY!!!) and I always give my kids' teacher a card wishing them a great school year but also letting them know they can always reach out should they need to. That's what I'm here for. I also give a fun little back to school gift, and I'll share what I'm doing this year in a few weeks.. I have just a few things left to get in it and I doubt I'll do it before baby comes. I have a small stack of Back to School themed paper that I've honestly been using for awhile now, but I only ever need small pieces so that $8.99 pad of paper has really gotten a lot of use. And then I found this super cute $1 worm stamp at Michaels so I'm trying him out, too. Super easy, super simple to put together but it's stinking adorable! If you aren't one to organize a fun back to school basket for a teacher, perhaps a gift card to a gas station, coffee shop, restaurant, liquor store, whatever is more appropriate? A little something to hopefully start their year off on the right foot? I have THREE of these cards left in my shop for purchase and you can click HERE to purchase!